We’re pulling a Persephone this week: partaking in forbidden fruit while we hang out with spirits. This week’s pairing will bring us to the fruity and tart world of Pomegranate White Tea, available from Trader Joes or online. If you haven’t had white tea before, the process uses tea leaf buds and processes them as minimally as possible. It gives the tea a really light, smooth flavor that doesn’t usually have the same grassy taste that a lot of green teas have. Similar to greens though, white teas are a good source of antioxidants. The hibiscus flowers and lemongrass in this tea will give it a vibrant tart flavor that’s fantastic both hot or iced. Blindsprings, by Kadi Fedoruk, follows Princess Tamura, an Orphic witch who’s spent the past 300 years fulfilling her half of a contract that’s indebted her to a group of spirits. After being pulled from her duties, she comes to realize that the rest world is in the midst of a crisis where Orphic witches are segregated and persecuted, and old bonds to the spirit world have been severely damaged or severed. She’s gentle and quick on her feet, with literal centuries worth of cultural and spiritual knowledge that’s been lost by other witches. Tamura’s trying to return to the good graces of her spirits, while also trying to help other Orphic witches thrive in a world that wants them completely wiped out. Section of a panel from Seeds. 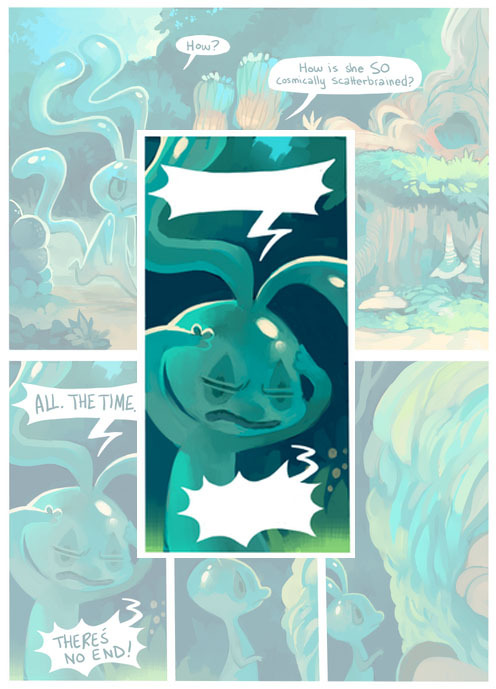 Flora, by PK with contributions from Marl and Milo, is a collection of short webcomics that are part of a large, interconnecting world called “Floraverse,” in general reference. The first few comics in the series, Seeds, follow Min, a Pygmy Pyzky and Cress, a Frostdrop who are on an important mission to deliver seeds. They’re off to a sour start, though. Everything goes haywire right from the get-go when they run late and miss their only opportunity to hand them off; now they’re traveling to distant lands stuffed with strange creatures as supernaturally inclined as they are. Where Min is flighty and flustered, Cress is optimistic and forward-thinking — and a little bit scary, to boot. This week’s pairing should be pretty fruity and sweet to match with this week’s protagonists, with a little bit of tart flavor to keep things interesting. the pomegranate flavor will help keep the supernatural vibe steady as spirit realms and underworlds and everything in between.